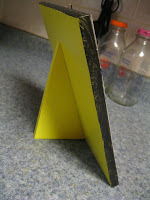 I made this recipe holder out of an old wooden bookend. It was an easy project to do with items I already had. I encourage you to keep your eyes peeled for possible items as you thrift shop and yard sale. 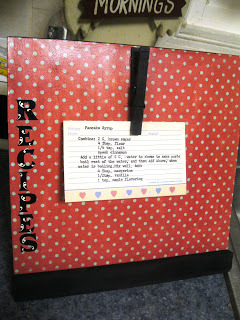 I kept mine simple since I didn't want to spend much/any money, but the recipe holder could be made several different ways. Use the new magnetic paints, or glue down a piece of sheet metal to hold magnets, etc. You'd be surprised out how you can re-purpose things, keep your eyes and mind open to the possibilities! Using modge podge on the wood, I applied the paper to the front. Next I applied some decorative stickers. Then I painted a clothes pin that I had on hand. 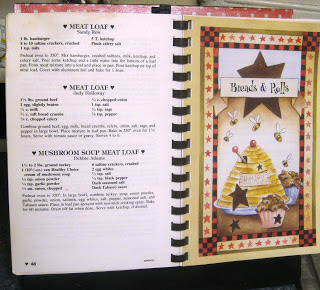 My husband cut me a scrap of wooden molding he had left over to use as a cookbook rest along the bottom. I painted that as well. While the clothes pin and molding were drying, I used modge podge on the front of the recipe holder to seal it and protect it from spills while cooking. When the clothes pin, and molding were dry, I hot glued the clothes pin and molding into position. I then used a few small finishing nails to secure the molding better, so it could hold the weight of the cookbooks.